Pre-heat your braai grill. Place the trout over a double-layered square of tin foil that will be large enough to wrap it up completely. Angle the sides of the foil up and drizzle over the honey, olive oil and lime juice, as well as a sprinkling of salt and pepper. The tinfoil should catch all the juices. Wrap the trout up tightly and cook for 8-10 minutes. I suggest opening the foil for the last couple of minutes for added braai flavour. Meanwhile, in a medium-sized pot of salted boiling water, cook the sweet potato until it can be easily pierced with a knife. For the last 2-3 minutes, add in the asparagus. Drain and set aside. In another small saucepan, boil the eggs. 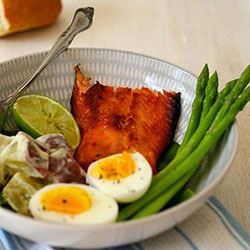 To serve, mix the sweet potato together with the mayonnaise and dill and add to the plate along with the salad greens, trout, asparagus and boiled egg. Drizzle with the lemony-dijon dressing, and add salt and pepper to taste. To make the dressing: Mix together, preferably shaken in a jam jar so that it emulsifies. Add salt and pepper to taste.